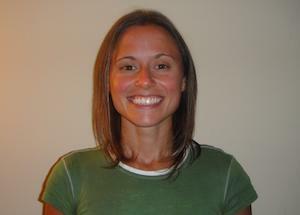 Following an application process late last year, Kristen Lutz was chosen to represent the AMTA and wear a Massage Therapy Foundation bib in the 2014 Boston Marathon. She's a fulltime practicing massage therapist, AMTA-MA Chapter member, and long-time runner, and she's got a great story. We'll be honoring Kristen's efforts and helping her raise funds at the February 9 complimentary Lunch and Chapter meeting in Natick, RSVP here. What is your massage career like? I've been a licensed massage therapist in Massachusetts since October 2009. I had a full -time job at the time and began my part-time practice at OMBE Integrative Health Center in Boston. It took only one year for me to move on from my full-time job and focus on expanding my massage practice. I am still at OMBE and last year I started a practice at Reebok World Headquarters in Canton, MA. I have the best of both worlds. At OMBE, I work with other practitioners and at Reebok I work on my own. While different, both are wonderful in their own way. At OMBE, I’m surrounded by other like-minded practitioners who are true masters of their crafts – acupuncture, chiropractic, life coaching, naturopathy, nutrition, Rolfing, personal training, Pilates and yoga. It’s an environment that has helped me build my practice through referrals from other OMBE practitioners or outside sources like doctors, midwifes, doulas, sports medicine professionals, running coaches, and word of mouth. As a whole, we specialize in sports medicine and women’s health. At Reebok, I see employees during their work hours. The employee culture there is one that more companies should embrace. Employees are encouraged to be healthy and are given the time and facilities to do just that. You're from Boston, what's your experience with the Marathon? Why did you become a massage therapist? Did you have another career before? Tell me a little more about you, what do you do for fun? My Twitter handle sums me up quite nicely: Board Certified Licensed Massage Therapist * travel fanatic * running enthusiast * organization buff * party planner * New England Patriots Kool Aid consumer. I tend to look at the brighter side of things and always try to put a positive spin on bad situations. I’m a glass-half-full kind of gal. I tell the best jokes! OK, they are 1st grade level jokes and some may say they are really cheesy. Humor is in the eye of the beholder, I guess. I grew up in an Italian household so cooking isn’t just required, it’s a birth right. My friends would say that I am so organized, it’s ridiculous. So I love planning gatherings and making travel arrangements. My favorite thing to plan is an annual Thanksgiving gathering of 45+ friends. Friends, even those who have moved thousands of miles away, adjust their holiday travel schedule just to make it. Most say they like it better than their family’s Thanksgiving. We will be celebrating the 10th year of USDTD (Up Side Down Turkey Day - of course there is a story behind the name). I’ve always enjoyed traveling here and there across the states. In 2008, I started traveling with family to Rock n’ Roll half marathon events. The first was in Virginia Beach and the second was in Philly. We stepped up our game and began international travel in 2010 and ran a half marathon in Bologna (Italy). The following year we ran a half in Otterndorf (Germany) and just last year we ran in Varazdin (Croatia). What kinds of events have you run before this? 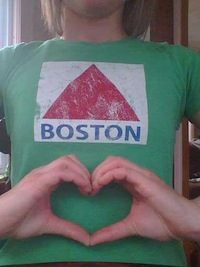 I ran Boston in 2004 and I thought I was a ‘one and done’. It was the first road race I’d ever ran. Yes. I chose the Boston Marathon as my first road race. I must have been high on a Patriots Super Bowl three-peat and the impending break of an 86 year-old curse on the Red Sox. I was in my first year of grad school at Northeastern and the opportunity presented itself for me to get a bib. I have to say it was one of the best and worst days of my life. I had over-trained, trained solo, became injured just 10 days before race day, and had to run in 85* temperatures. Despite those obstacles I finished…but not within my goal time. I felt beat up for weeks after and really wished my apartment wasn’t on the third floor of a building with no elevator. Can you see why I wanted nothing to do with marathons ever again? It was about two years ago that I started to get the itch to run Boston one more time; my road to redemption. Since 2004 I've run a handful of half marathons, in the U.S. and in Europe, so many 5Ks and 10Ks I’ve lost count, and a Reach the Beach NH Relay. Since running Boston I now know how to train and have integrative health practitioners who I’ll be seeing to help get me to that finish line in one piece. Ten years later, I’m at it again! So great! I’m very excited to run Boston this year for The Massage Therapy Foundation Running for Research Charity Team. I was really happy to hear that the 2013 runners were invited to run this year so they will be joining the 2014 team that also includes Kathy Laskye and Karen Moers. I have a vast network of family, friends and colleagues who have showed tremendous support. I'll be proud to not only raise money for my profession through the Massage Therapy Foundation, but to run side-by-side with friends and clients who seek another shot at Boston. The Massage Therapy Foundation and the massage community have been wonderful. I truly believe it takes a village for endeavors like this and I have quite the village! My training runs are going great. I especially love my Saturday mornings as I take my run to the Newton Hills with hundreds of other runners gearing up for April 21st. Being a part of the Boston running community is so inspiring and keeps me moving towards my goal of finishing Boston strong and reaching my fundraising goal. If you’d like to help, please visit my CrowdRise donation page. Your contribution (however big or small) is appreciated!